After having dinner at the Oxbow Public Market, our group walked back to one of our host hotels, the Napa River Inn. I had not yet been up to my room to check it out, because I was a little late arriving to Napa. So after a little too much wine (welcome to Napa! ), I grabbed my bags (a little heavier at this late and foggy hour) out of my car and made my way up to my room. But first, some outside shots and a little about the Napa River Inn and the Mill. This is the Historic Napa Mill building, which houses the Napa River Inn. The Mill building is a National Registered Landmark built in 1884 and situated along the Napa River Walk. At one time, the warehouse stored fertilizers, feed, supplies, and Napa Valley wines for local vineyards. 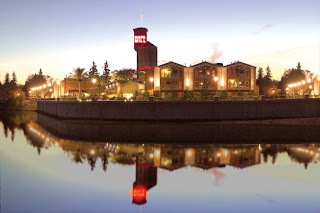 During the 1990s, the Napa River Inn was constructed inside the Historic Napa Mill and warehouse by Napa Mill LLC. Designs for all interiors of the hotel were inspired by noted designer Sandra Blake. Many rooms and suites were designed to reflect the original building and feel of historic downtown Napa. This is a mosaic fountain done by Alan Shepp. The work of art seeks to capture the essence of the whole Napa Valley story, its glories and its tragedies. The piece spreads from the fountain onto the walkway, and includes the mosaic at the opening of this post and a depiction of the Napa River, including the Oxbow. Also taken behind the building, this is some of the greenery alongside Angèle Restaurant and the General Store. A big, lovely, velvety, canopy bed! The rooms with canopies are also fashioned with overstuffed furniture, fireplaces, clawfoot tubs, and walk-in showers. The rooms are also equipped with a spectacular coffee maker (a Keurig model). I am not exaggerating. It was some really righteous coffee, (especially when I had to get up at 5am the next morning!) It brews one or two cups at a time. Did you know Emeril Lagasse has a line of coffee? He does. And that is the brand the Napa River Inn stocks in your room. There is also an electric teapot and an assortment of Tillerman Teas. Remember them from the last post? Here are some photos and descriptions of the other rooms available in the Napa River Inn. You can follow the Historic Napa Mill on twitter here, and find them on Facebook here. Also, if you happen to live in the area, check out this contest put on by several local businesses in the downtown Napa district! "Kristy is such a great supporter of community and gives of her time and talent generously. We greatly appreciated her participation at Stanford Home for Children's 5th Annual Sacramento Valley Wine Auction. Her goodies generated a buzz amongst the crowd, and we hope to continue our partnership in the future!" I cannot thank you enough. The cake was amazing! Craig was totally surprised and enjoyed every last crumb he ate. The flavors were spot on and just enough butter cream, well is there ever really enough? Thank you for making our special night very unique!" "The cake was a hit!! It was soooo yummy! Everyone was wanting to taste each layer. :). Thank you so much! I hope we can order from you again for another occasion!" "The cake I won is mouth watering, fabulous!!! Is that called a Velvet Cake? Totally Awesome!" "We want to thank you and Jon for coming over during our Grand Opening Day and for the delicious cupcakes. They were just perfect size for little kids and even adults love them. That was very kind of you." "The purple booty fondants were beautiful and we were surprised when we discovered they were edible! Thanks again for the wonderful cupcakes, everyone raved about them…." "I just wanted to drop a quick note and thank you again for the AMAZING job you did with our wedding cupcakes and cake. Everyone was raving about how delicious they were! As soon as I get more photos from my photographer, I will be doing a blog post on them and will keep you posted on when it goes up."